We hold our babies for two weeks after the date of deposit or anticipated ready-to-go date” if deposit is made prior to weaning with no additional charge. The later of the two dates applies. Babies are cuter than adolescent hedgehogs. It is often seen that people see younger babies and wish that they were taking home a younger, smaller pet. The longer we hold a baby past the weaned and ready to go date the fewer options for substitutions are available. We have limited space available and keeping babies into “adolescents” presents housing challenges for us. The longer we hold babies the more cost we incur as a breeder. We do our best to keep our prices low and our price is set at the care and upkeep of a baby. We try to be fair and consistent and have the same policy for everyone! We are happy to care for a hedgehog longer than two weeks for $2.00 per day. 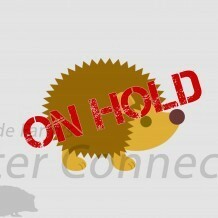 The care and upkeep charge will be required to be paid in ADVANCE for hedgehogs not picked up within two weeks of the determined target pick-up date. If after 2 weeks the hedgehog still has not been picked up, the hedgehog will be marked as available and the deposit will be retained. If we contact the customer (whether via phone or email), they are expected to respond within 2 calendar days. If the customer does not respond, it will be assumed that they are forfeiting their deposit and the hedgehog will be marked as available. We understand that some of our customers are not able to rearrange their plans and need to pick up their baby on the target pick up date. Please be advised that Millermeade Farms cannot be responsible for any negative impact from not following our advice.